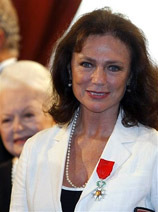 It's not Jacqueline's, but it is the best fan page for the latest news: Jacqueline Bisset Fan Forum. You do need a facebook account and membership in the group. (Sorry it has been almost a year since I updated here.) Jacqueline co-starred in Dennis Hopper's last film, The Last Film Festival. The film was largely done when Hopper died five years ago. Since then it has been in limbo. Producer/Writer/Director Linda Yellen has now launched a Kickstarter campaign to raise $90,000 to finish the movie. After four days, they have raised more than 20% of that. There are various rewards for different pledge levels. Check it out if you are interested. Jacqueline has been cast in "Peter and John", which will be filming in Nantucket, MA, starting in April, 2014. There is also a Kickstarter campaign to help fund the movie. Update: The production company's website now says this film will be released in "Summer, 2015". Although they are still soliciting donations. Jacqueline Wins Golden Globe for Dancing on the Edge! On Sunday, January 12th, 2014, Jacqueline won the Best Supporting Actress in a Series, Mini-Series or TV Movie Golden Globe for her role in Dancing on the Edge. The miniseries was produced by the BBC, and shown in the USA on the Starz network. Jacqueline was clearly shock and overwhelmed by the award (the second one given out that night), and it took her a while to get to the stage and to get started on he remarks. This elicited a lot of buzz and jokes, including a bit on Saturday Night Live's "Weekend Update". The follow-up included appearances on Piers Morgan's and Queen Latifah's shows in the following weeks. Jacqueline will receive a "Special Award for Contribution to World Cinema" at the 2011 Transilvania International Film Festival, this June, in Cluj-Napoca, Romania. Jacqueline will be a special guest at the Jules Verne Festival's tribute to Steve McQueen, called "The King of Cool Returns To Hollywood", November 11th in Los Angeles. Tickets are available. See more information at the festival's website or read this article. I have sold out of both volumes of the DVD set. But contact me if you want to be on the list if it is reissued. Volume 1, covers the 1980s, and volume 2 covers 1990-2004. email me. ET Online reports that Jacqueline will receive France's "highest honor", the Legion D'Honneur on Thursday, September 9th, in Paris. Update: Photo at left shows Jacqueline with her ribbon and medal. There are some new links on the Links Page.